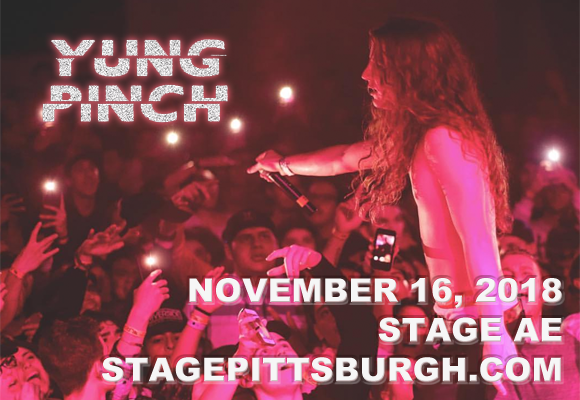 Yung Pinch is making some huge waves in hip hop right now, and the 21-year-old rapper comes to Stage AE on Friday 16th November 2018 on the Lost at Sea Tour! No stranger to hitting the road, Yung Pinch has opened for huge acts like G-Eazy and Migos, and is taking to the stage this winter for a full-power headlining tour, hitting up 39 cities as he goes! Don't miss your chance to see one of the most talked about new names in hip hop spit some serious fire! Based in Huntington Beach, California, American rapper Yung Pinch first gained popularity with his collaborations with producer Brandan "Matics" Maddox. The two released the tracks "My Time", "Bring Me Down" and "I Care" on SoundCloud, culminating in over three million streams. These tracks were a prelude to Yung Pinch's debut EP 4EverHeartBroke, followed by the mixtape, 714Ever, which was released on SoundCloud in late-2016. The EP and mixtape were both well received and led to Pinch opening for and working with several high-profile rappers, including: Migos, Playboi Carti, Lil Uzi Vert, Young Thug, Bone Thugs 'n' Harmony, Nipsey Hussle and Ty Dolla Sign. In 2017, he released 4EverFriday Szn One, the first in a mixtape series. He most recently released 4EverFriday Szn Three.